BLEISURE EXPERIENCE. Business travelers these days know how to squeeze some time off to have a more relaxing experience while on hectic official trips. Graeme Pearcey, partner support director for Destinations of the World (a business-to-business travel industry wholesaler) travels for work often, covering four to six destinations a month worldwide—at times, 10 locations if things really get busy. He added that about 90% to 95% of his travels are mainly for business, and “very rarely” he has an opportunity to take some time off during these official trips. Simone Colombara, managing director for an accredited special accessing entity in the Philippines, shared he travels for work every two weeks domestically, and every quarter internationally. “I usually try to extend to the weekend, if the business travel is around those days. It's always a pleasure for me, even if other might think it's tiring. It is,” said Colombara. Bleisure (a coined term for business and leisure) covers the segment of the business travel population that has the means and professional flexibility to add leisure days onto business trips. According to the Bridgestreet Global Hospitality’s Bleisure Report 2014, six out of 10 travelers are away from home on business 10 or more days per year, with two of those travelers away for 60+ days. And these business travelers are more meticulous about the amenities they look for in a place they work or stay. Pearcey shared that his heavy travel legs run from two to three days per geography, and extends up to two weeks if he has to be in their headquarters in the Middle East. “Attentive staff is a good start,” Pearcey told Entrepreneur.com.ph via email. 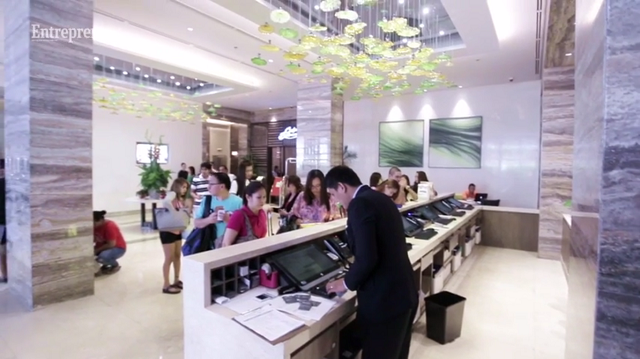 Strong, free WiFi access for guests is a major come-on for the nearly 8-month-old Belmont Hotel Manila, the homegrown brand of “bleisure” hotel by Megaworld Corporation of billionaire Andrew L. Tan. 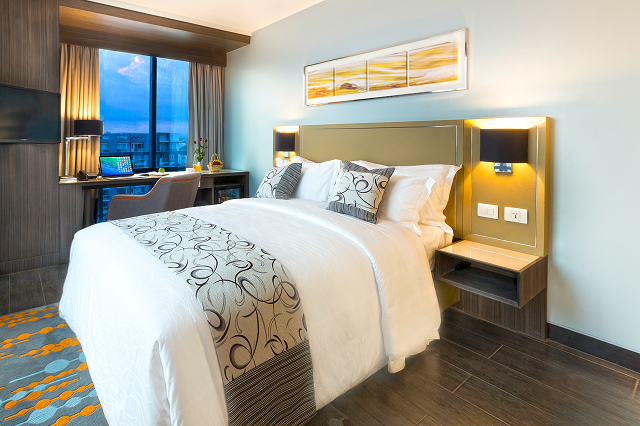 Belmont Hotel Manila is really capitalizing on the bleisure experience for its guests, since it is across the Ninoy Aquino International Aiport terminal 3 (NAIA 3), and it is located within the integrated business, commercial, residential district of Resorts World Manila, Newport City in Pasay. It is also across the Marriott Grand Ballroom—currently the largest in the country and an ideal venue for meetings, incentives, conferences, and exhibitions (MICE). ACCESSIBILITY. Expect more bleisure travelers to come in from here and abroad once the airconditioned footbridge connecting NAIA 3 and Newport City is completed within the year. Belmont’s General Manager Lorenzo Tang said they invested in WiFi access of up to 40 Mbps, on top of providing the basic, yet quality hotel amenities a weary business traveler looks for, like a comfortable bed or high-pressured shower. Guests are usually availing of the gym and swimming pool facilities, while some are looking for a bar which the hotel aims to address as well, Tang added. But for Colombara, it is uncommon for him to stay in the same hotel for business and pleasure, as the quality of the business hotel is more suited for meetings, along with a different level of service readiness, while a leisure accommodation has more apt features like swimming pool, sea view, travel opportunities nearby, plus a travel agency located within. Belmont, or the Newport City for that matter, wants its hotel guests (who stay an average of two to three days) to experience both business and leisure within the complex. And if the airconditioned footbridge that connects NAIA3 to Newport City would be finished within the year, Belmont, and other hotels in the complex like Maxims, Marriott, and Remington, would then capture a more sizable number of bleisure travelers for guests, offering them arts and culture (via Newport Performing Arts Theater); casino; dining; and shopping experience—all in one location. “The business travelers are not working 24 hours [a day], they need some moments to rest, to enjoy life,” said Tang. AIMS TO PLEASE. 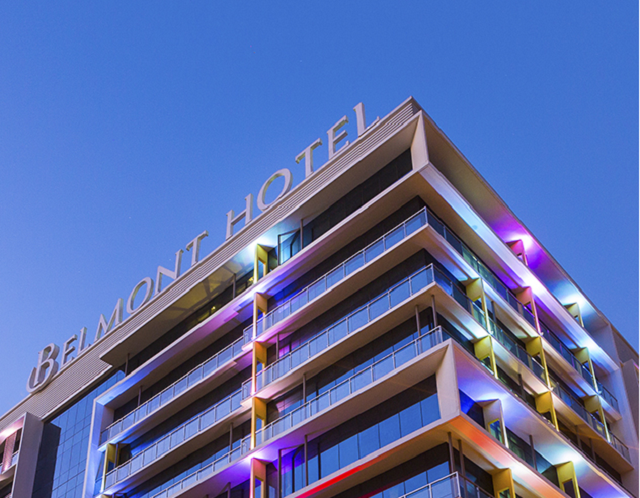 Hotels like Belmont aim to be more attentive to the fast-paced life of today's bleisure travelers. And Tang said the hospitality and tourism industries need to me more adaptable to the changing needs of bleisure travelers. “You (business traveler) need to regenerate yourself. You need to have a good night’s sleep. (In turn), a hotel needs to have available, an any time of the day, the love of service. And we really want to deliver to our guests. We focus not only what you’re feeling inside the room, but how you perceive the hotel, or (if you’re) in public areas (nearby),” said Tang. Sightseeing, dinning, and arts and culture are the three most popular bleisure activities and Pearcey and Colombara have the following tips on how they squeeze such activities in their fast-paced business trips. “I try to see something if I have the time—this way, I have seen Westminster Abbey (London, England); The Forbidden City (Beijing, China); Taipei National Museum (Taiwan); The Imperial Palace Outer Garden (Tokyo, Japan); the old town in Tallinn (Estonia),” Pearcey shared. Colombara urged that a bleisure traveler use the weekends or nights for some exploring. “Traveling by plane or bus during the night not only gives you more time for sightseeing, but saves you on hotel cost,” he said. “Being gifted of a job that allows me to travel and not leveraging it to explore and learn about local places and people would be wasting the opportunity to grow my understanding and knowledge,” Colombara concluded.